Our 1 month expedition is a jam-packed adventure of culture, ethics and experience. This expedition is for young & enthusiastic individuals who want to make a real contribution, meet like-minded people & challenge themselves. If you prefer to experience Fiji as the locals do whilst uplifting children living in poverty, rather than just relaxing by the pool then you’re in the right place. Joining a 1 month team means you will spend just over 3 weeks living with your own Fijian family as a member of the village & volunteering in a local rural school. Plus 6 days in a beach resort across the briefing & R&R phases of the expedition. We pack a huge amount into this expedition to make sure you get the absolute most from your experience, whilst providing rural schools with real, targeted and proven benefit. A Think Pacific 1 month expedition is just about the most inspiring thing you could do! Join a team of up to 20 volunteers and live at the heart of a remote Fijian village. Experience island life and make a difference to children living in hardship. Aside from making a difference, you’ll have the biggest adventure of your life. From trekking extinct volcanoes to climbing jungle peaks and exploring remote waterfalls. 1. Bula, Welcome to Fiji! Forget about the day job or the stress of exams by arriving in the exotic South Seas. 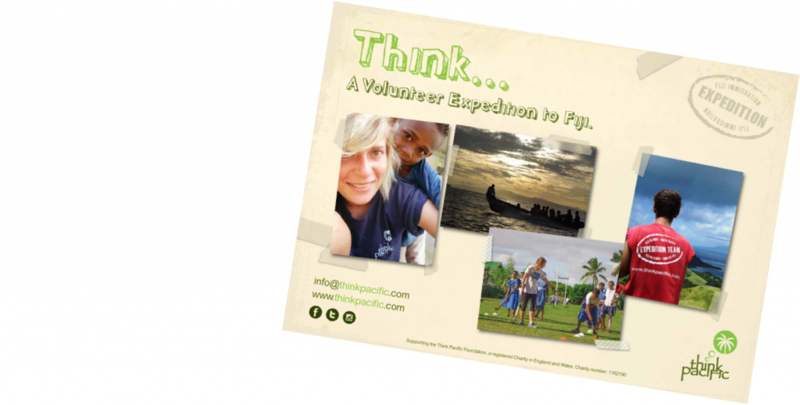 You will land at Nadi Airport and be met by your Expedition Leaders for the first time. Every expedition starts with an all inclusive 3 day briefing at a beautiful tropical beach resort. This is time for you to get to know your team mates and wind down into ‘Fiji time’. We focus upon developing youth and sports in remote primary schools. You’ll provide one-to-one tuition and establish kindergarten programmes, coach a variety of sports & lead ‘The House Cup’! The days are rewarding and incredibly busy! Over 1/3 of your fee supports the long term charity aims in Fiji and ensures the sustainability of the youth and sports inititives we implement. Many of our volunteers fundraise this entire amount. All meals during your briefing, all meals for 3 and a half weeks staying with your Fijian village family and breakfast and evening meals during your final days of R&R at glorious beach resorts.